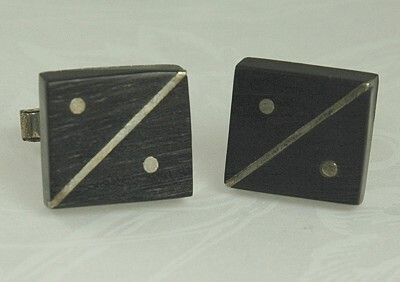 SOLD WAS: $105.00 NOW: $85.00 Teak wood in black is enhanced by sterling silver giving these links a modern and natural look. Signed "Sterling". Condition: Excellent vintage. These cufflinks have not been polished. A warm patina has developed. Measurements: 3/4" long and 1/2" wide.